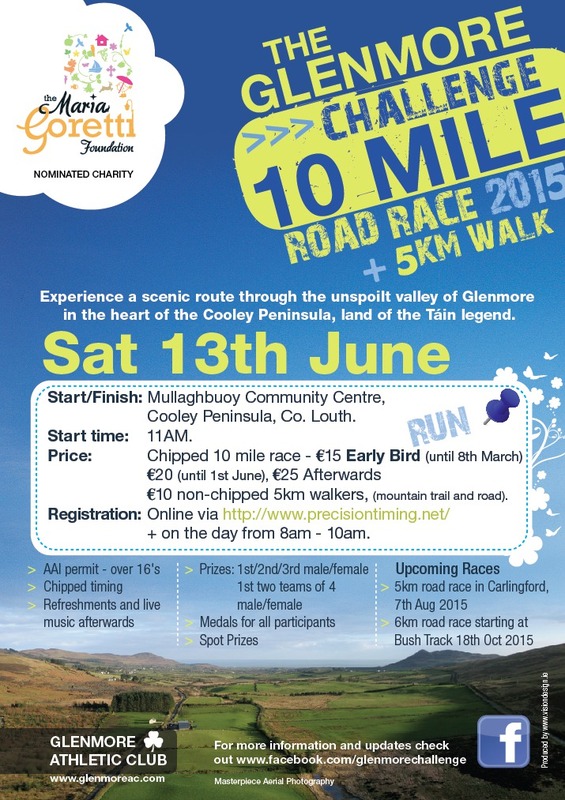 Saturday 13th June sees the second running of the “The Glenmore Challenge” a 10 Mile road race with the route taking in the wonderful scenery of Glenmore valley, Cooley Peninsula, Co. Louth. (There will also be a 5k Trail\Road route for walkers). The race which is AAI permitted is open to all those who are 16 years of age and older, will be chip timed for all runners. All finishers including walkers will receive a specially commissioned medal for the event. here are prizes for 1st, 2nd, & 3rd male and female along with 1st two teams of 4. Teams of 4 male/female.